is a lot like chicken soup. in a beautiful striped bundle of love & fur. 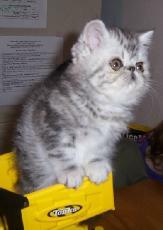 Most Silver Tabby Exotic Breeding Programs incorporate cats of different colors and coat lengths. "You have to build your barn before you paint it." no matter the color or pattern or breed or hair length. by selectively choosing cats that have clear silver color and well defined tabby pattern as you go along. 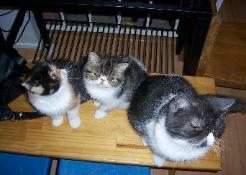 Badly tarnished silver or poor tabby pattern are hard to breed out of your line. So, think carefully about what you are doing! Be realistically prepared for disappointments and setbacks. And keep your eyes on the prize! Focus on your goals. What each individual breeder chooses to use in his/her breeding program is totally up to that individual. and different things are important to different people. Mother Nature breaks the rules all of the time! my personal preference is to stick with a color-bred program as much as possible. That includes using smokes and shaded silvers more than solids. My plan is to avoid using brown and blue tabbies. But, I have learned....never say never! What Can I Get IF...?